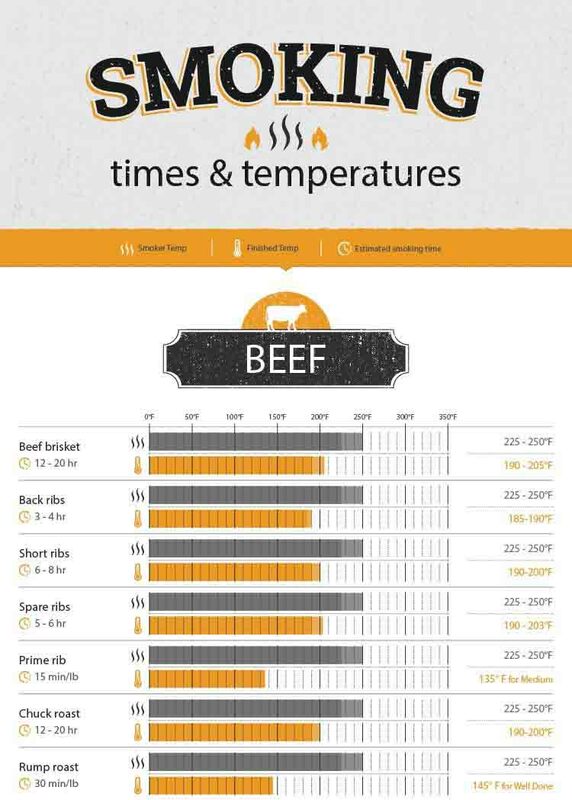 The way you slice a brisket has a MASSIVE impact on the appearance and taste of your finished product. We think you’ll agree with us when we say it makes zero sense to slave over a piece of meat for 12+ hours, only to hack into it at the last second with any old knife you have lying around. “It’s just a knife, how hard could it be?” You might ask. Even though a knife sounds like a pretty straight forward item, there is still a lot of confusion about what actually makes a knife good for slicing brisket. The good news is that unlike a lot of fancy chefs knives, a great brisket slicing knife doesn’t have to cost you hundreds of dollars. We’ve put together this guide to help you choose the best knife at a range of price points. You’ll also learn what actually makes a great brisket knife, and what’s just old pit master tales. You could buy a half decent chefs knife or any number of long serrated knives and they would all do a decent job at carving brisket. But any true brisket expert knows that “half decent” isn’t good enough. It’s all the little details that seperate O.K. brisket from the kind that your neighbours will tell stories about for years to come. If you just want to make sure you’re using the best knife, we can confirm that the Victorinox is virtually flawless when it comes to slicing brisket. The little details is where the Victorinox shines. At 12 inches long the knife can easily slice large briskets in a single stroke. While you could easily slice paper thin with this knife, it does an equally good job holding a straight line while cutting pencil sized brisket slices. Fibrox handle grips well and just feels good in the hand. Although the handle can scar a little this is a minor concern for us. 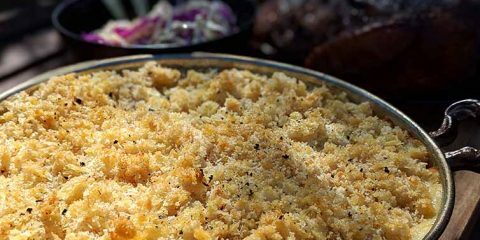 Granton edge is perfect for cutting through fattier cuts of meat like brisket. If you’ve tried to carve brisket before using a shorter chefs knife you’ve probably struggled with tearing. The shorter length of other knives means you have to make multiple cuts per slice, resulting in uneven cuts. Not to mention the awkward motion making slicing lots of brisket a massive pain the backside. Granton edge refers to the hollowed out grooves that run along the sides of the blade. These grooves fill with any meat juices or fat. 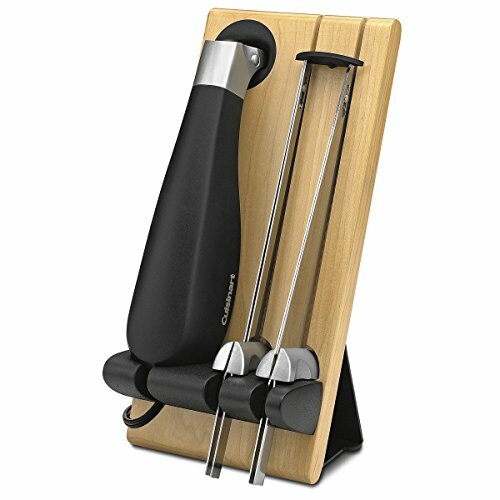 While slicing brisket this allows for thin, even cuts without any tearing. 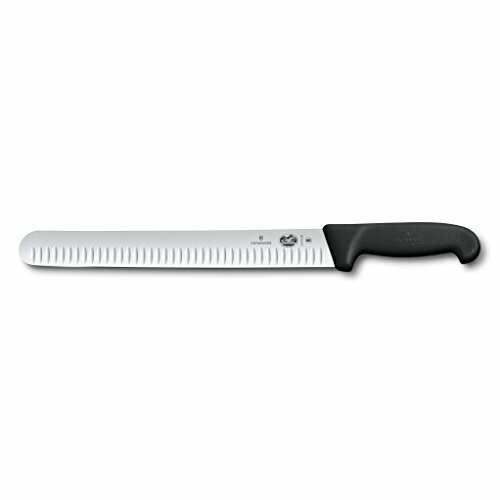 At a fraction of the cost of a good quality chefs knife, the Victorinox represents great value. Even if your knife skills leave a lot to be desired, upgrading to the 12″ Victorinox Slicing Knife will make a huge difference in improving the quality and appearance of your brisket. In his excellent YouTube series on smoking your first brisket Aaron Franklin recommends using a 12″ serrated knife for carving brisket. People queue for hours to get a taste of Aaron’s brisket so we think he probably knows a thing or two about slicing brisket. 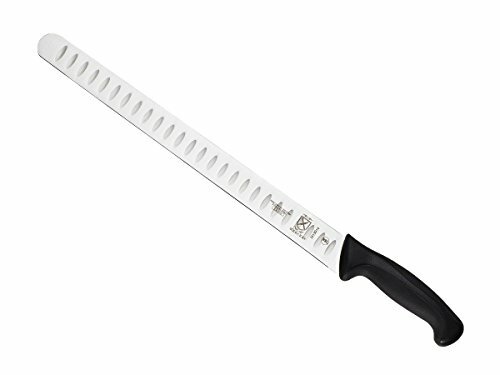 This 12″ Dexter slicing knife is usually available less than the Victorinox, making it a great value brisket slicer. The scalloped serrations are designed to cause less damage to food. This is crucial makes the knife more forgiving for newbies when it comes to slicing brisket and helps you minimise tears. While we are reviewing this knife on it’s ability to slice brisket, it will also double as an excellent bread slicer or for carving any large chunks of meat. 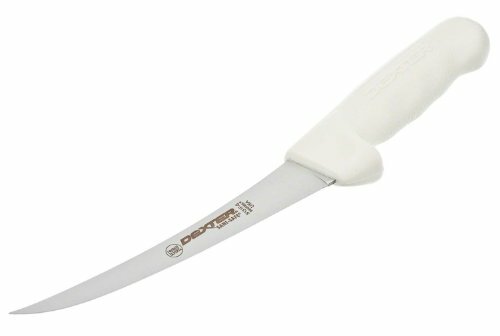 With the white plastic handle this knife isn’t winning any beauty awards, but the most important detail is that it arrives super sharp, and the handle is heavily textured which allows for a good grip. The scalloped blade is nice and high and makes cutting through fatty meat super easy. Also makes it a versatile bread or vegetable slicer. 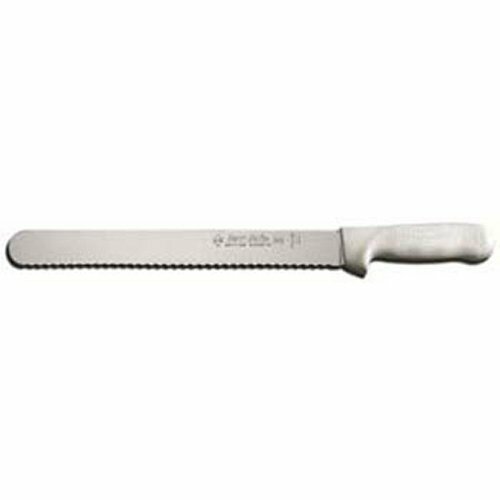 At 14″ the Mercer granton slicer is a great knife to add to your arsenal if you are going to be slicing a lot of larger briskets, turkeys or other large meats. 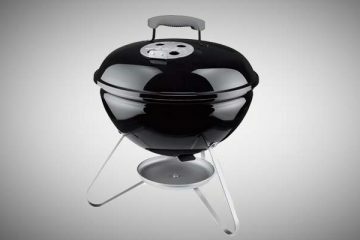 Mercer are a highly regraded brand among professional chefs and pit masters alike. For a budget price you are getting high quality Japanese steel that is easy to maintain and keep razor sharp. The thinness of the blade and 17 degree bevel angle allows you to cut extremely accurate, straight lines. We’ve made it pretty clear that we are big fans of the granton grooves which help you avoid the blade sticking while slicing brisket. It’s hard to find much to fault this knife for without starting to nit pick. At this price point you are not going to get premium materials, but the Santoprene plastic handle and Japanese steel are more than satisfactory. If you think you’ll be cooking a lot of larger cuts of meat, then the 14″ Mercer is a great option. Generally a carving will be thicker and less flexible with a pointed tip, a slicer will be thinner, more flexible and rounded at the end. A carving knife will get the job done, but we prefer the better cuts you get from a proper slicing knife. Electric carving knives tend to get a bad rep around barbecue circles. Some people reject them outright, suggesting that we “throw out the electric knife right now. Don’t waste your time”. For large items or if you are cutting a lot of volume the electric can make the job a lot easier. If you hear that electric slicer going then chances are the brisket isn’t very tender. Electric knives help make the slicing an easier task when it’s your singular task for hours at a time, but I can’t stand the noise. When an electric knife is in action, its whine is all you hear while waiting in line for barbecue. It also doesn’t do much to help aesthetics. 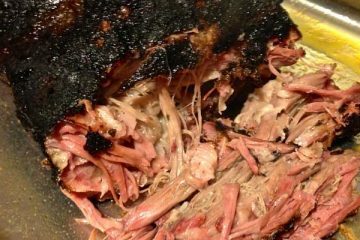 Even if the brisket is moist, the appearance of the shaggy meat makes it look dry as a bone. Hardly a ringing endorsement though! With all these electric knife haters out there we were a bit surprised to see so many professional and competition cooks using electric. If it’s good enough for bbq competition winners, then we think it’s good enough to recommend. 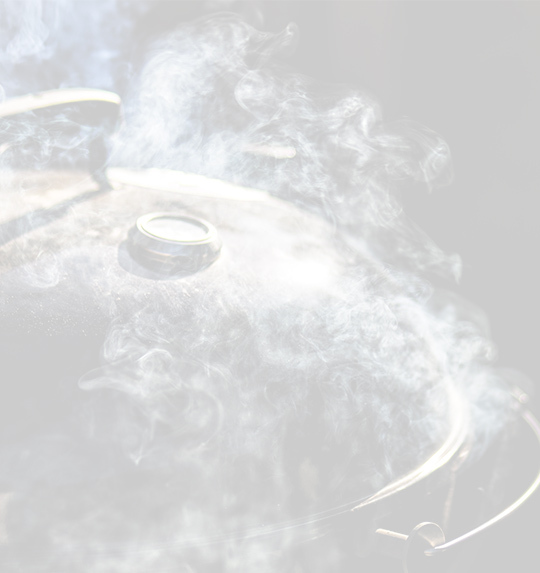 Many smokers value old school, traditional methods. Just like cooking with charcoal is superior to using an electric smoker, carving brisket with a manual knife is just the “best way”. Lots of electric knives are pure crap. A cheap serrated knife will beat a cheap electric every time. As we’ve mentioned previously, kitchens around the country are full of low quality electric knives that you shouldn’t let near a cooked brisket. This is definitely an area where paying a little extra goes a long way. 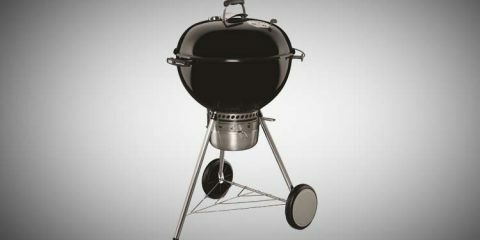 The Cuisinart CEK 40 is the weapon of choice for many competition smokers and backyard barbecuers. At 4ft the power cord is long enough for you to manoeuvre around anything you need to slice. Knife and blade come apart for easy storage in the included wooden tray. You also get different blades in the same package. 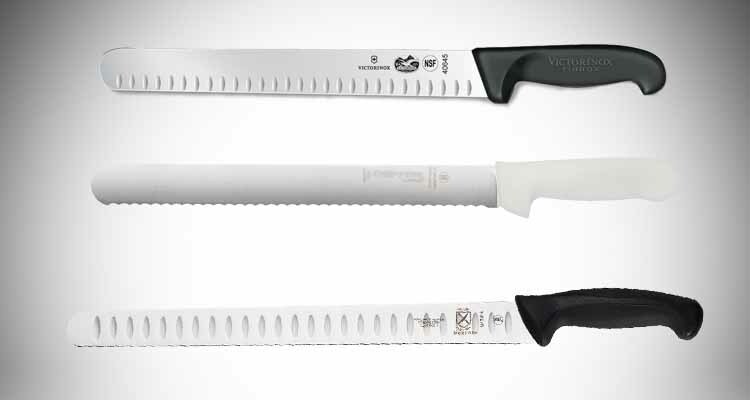 One for slicing meat and the other for bread. The only issue with the Cuisinart is that the handle can get pretty hot with extended use. Otherwise the only issues is the same you would have with any electric. The cord can get in the way, and it’s frustrating to have the cord run through the meat juices. If you’re going to be carving a lot of meat for a decent amount of time then give the Cuisinart knife a go. While we’ve been focussing on the best knife for slicing brisket, you probably want to avoid using the same knife while preparing your brisket. In Aaron Franklin’s excellent brisket video tutorials, he recommends using a good narrow curved boning knife. We like this advise as well. A semi stiff, curved knife will be thin and sharp enough to easily slide the knife under the fat and silver skin and remove it without taking any valuable meat off. 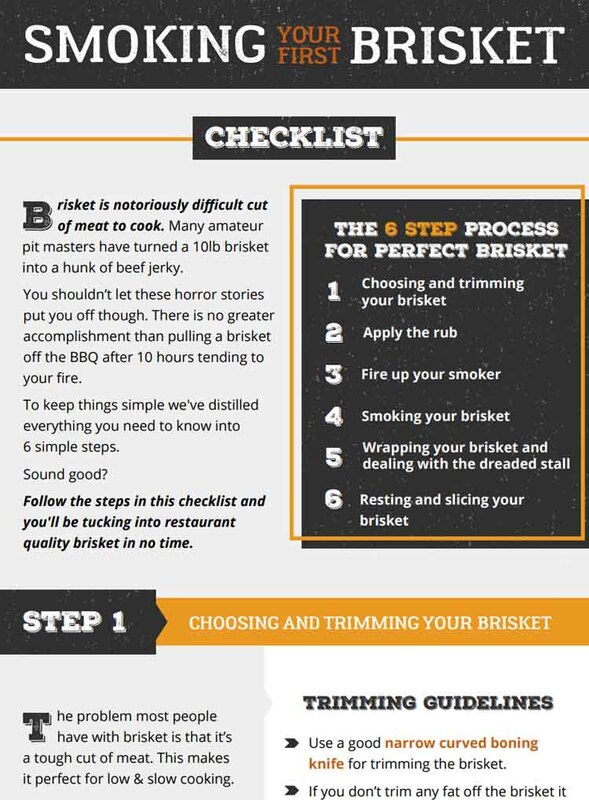 Between 6″ – 8″ works best for trimming brisket, while still being a versatile knife you’ll keep reaching for when preparing different cuts of meat. Dexter Russell are highly regraded among knife enthusiasts. And for good reason. This 6″ commercial grade boning knife is made in the USA and is great value. The blade shape and length make it perfect for slicing under brisket fat and making deft cuts without removing any meat. The blade comes extremely sharp and holds it’s sharpness well. If you have larger hands then being able to get a comfortable grip can be a challenge. Dexter Russell say the handle is built using “Grip-Tex”. We’re still not quite sure what that means, but have found it to be handle super comfortable and easy to grip. We’ve heard some reports of the knife arriving a little bit blunt, but most people say it cuts great without needing to be sharpened. The only other complaints we’ve heard is that this knife can ruts easily if not cared for properly. Always hand wash and dry immediately. For a budget option the Dexter Russell still represents a great knife for trimming brisket. The last thing you want to do after buying a brand new knife is chuck it straight into the dishwasher before understanding how to properly look after it. Learning proper care and maintenance pays for itself through increased lifespan, better performance and less chance of your cutting yourself. Knives should never be washed in a dishwasher as the intense heat and detergents can cause the handle to deteriorate. Always wash knives by hand with soap and warm water before rinsing and drying right away. For keeping your knife sharp you have a range of options. 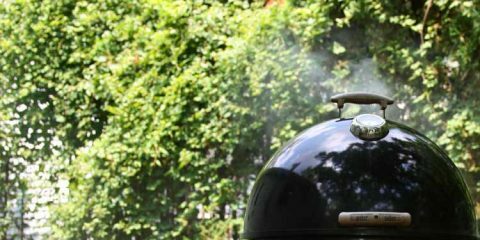 We cover this in much more detail in our general guide to choosing and caring for barbecue knives. For a simple sharpener on a budget we like the Presto Electric Knife Sharpener. So long as are careful to avoid applying any downward pressure and focus on drawing the knife slowly across you can keep your knives super sharp. The good think about brisket knives is that they won’t cost a lot and a decent knife will hold its edge well. 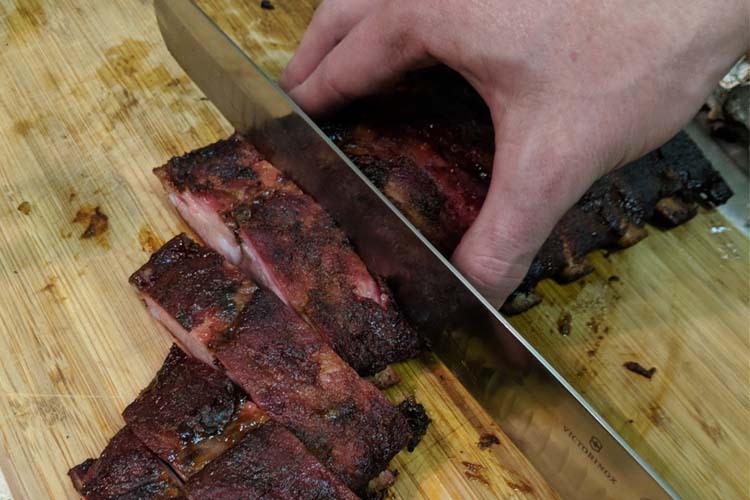 So long as you get something long enough (12+ inches) and go for a serrated or granton edge your new brisket knife will be a huge upgrade over any random knife. Make sure you stay clear of using anything that comes in a carving set (which would contain a fork). These are generally cheap knives and will not hold a sharp edge. Spend the money on a decent dedicated knife instead and you’ll thank us every time you start slicing into your brisket.